Manitoulin-Sudbury DSB Paramedic Services provides pre-hospital care to the sick and injured at a primary care level. Our primary focus is to provide professional & medically proven health care to the communities that we serve. To utilize only staff qualified under the Ambulance Act and its regulations (Approximately 115 staff members working at a Basic Life Support Level). 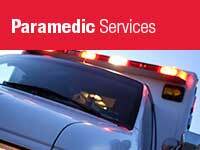 To utilize only vehicles meeting the current "Ontario Provincial Ambulance and Emergency Response Standards". (23 ambulances covering our 12 locations). To ensure that all on site staff respond to priority 3, 4 and 8 calls within 2 minutes. To ensure that all on call staff respond to priority 3, 4 and 8 calls within 10 minutes. To ensure that all other calls are done as soon as available resources allow for a response. To continuously monitor, meet and try to exceed the 90th percentile response time standard in place. To ensure that patient care being provided is in accordance with the standards set out in the current "Basic Life Support Patient Care Standards" , and local Base Hospital requirements. To supplement land ambulance resources with an Emergency First Response Team response in areas where teams are in force. The prime mandate of Manitoulin-Sudbury DSB Paramedic Services is to provide emergency medical care and transportation to the residents and visitors of the Manitoulin-Sudbury DSB. a medical professional has determined that an ambulance is the most appropriate option to transport the patient. Alternatively patients can be moved by an accessible taxi, family members, a transportation service offered by a volunteer organization or a private medical transport service, where available. Manitoulin-Sudbury DSB Paramedic Services provides Non-Emergency transportation to our residents when the decision has been made that the ambulance is the best method of transportation because of the patient's condition. However it must be recognized that, even with these additional resources, we can only move non-emergency patients when the use of our limited resources will not jeopardize our prime mandate of emergency medical coverage.